Shoe Dog is fun! It certainly doesn’t read like an autobiography of a mucky-muck corporate exec, Founder, CEO. And yet, it is! I love the way Knight laughs at himself, shares his faux pas and mistakes, his weirdness, his worries. As a professional coach of entrepreneurs I was intrigued by his lack of articulated vision. He talks about a “crazy Idea” but isn’t very clear. We eventually learn that it is buying shoes from Japan and selling them here. But how fun to watch his crazy ideas evolve over the years. Knight faces untold challenges. He begins with $50 from his father in 1963 by selling shoes out of his Plymouth Valiant, and grossing $8000. His memoir is humbling, seemingly unfiltered, refreshingly naïve. He doesn’t do much of anything by the books. I don’t know HOW he remembers most of these events from 1964, 65, and beyond, but he seems able to pull threads from his past and watch them reawaken. Three hearts vs four was a tough decision for this book. While I really enjoyed the tale Knight weaves for us and his engaging style, I became a little bored with his financial difficulties. And not so much even bored with those, but I actually wanted to know more. Every time he spoke about design challenges, or marketing challenges, or his social ineptness, I found myself leaning forward. I wanted more on the breadth of his business – more about his retail philosophy, more about the athletes he signed, more about his organization structure and how he grew and inspired his employee base. 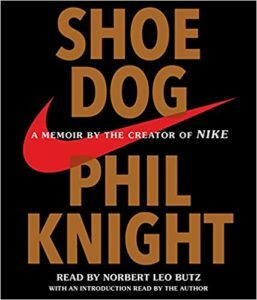 Knight gives us one sentence – one lousy sentence – when he changes the name of his business from Blue Ribbon to Nike, after seven years. I bet there was a bit of angst over that momentous decision! Shoe Dog may also be a bit more interesting to us Oregonians than to mere mortals(!) It is an Oregon story, down to its roots.